What Are the Causes of Lipomas in Birds? Lipomas commonly affect overweight birds. Your bird's health is important to you, so if you notice a lump anywhere on her body, you're immediately concerned. If the vet starts saying things like "lipomas" and "necrotic," find out what they mean and what causes lipomas to form, then develop a treatment plan with your vet. Lipomas are fatty tumors that can develop just beneath your bird's skin. Usually they appear on the stomach or chest area, but they can occur anywhere on your parrot's body, including internally. They can vary in size from hardly noticeable to large enough to affect your bird's mobility. The bird may peck at them and hurt himself, or they may become infected. A common cause of lipomas is obesity, as is a deficiency of vitamin E. Bird Veterinarian explains that your bird's body needs to store excess fat, which it deposits either in the liver or in other tissue like the skin, resulting in a lipoma. Parrots of any variety can develop tumors, but sometimes genetics plays a part. Species of parrots that are predisposed genetically to fatty tumor growths are galahs, budgerigars (budgies), rosellas, Amazons and sulphur crested cockatoos. 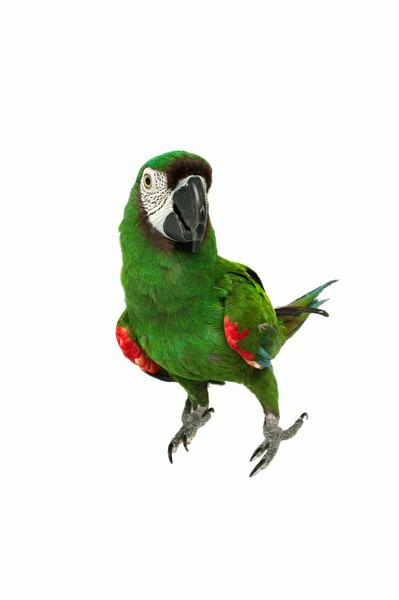 The typical treatment of lipomas in parrots starts with switching to a low-fat diet. This means switching from high-fat seeds like sunflower seeds to fruit, vegetables and sprouted seeds for variety and additional nutrition. Iodine may be recommended as a supplement to encourage the metabolism of fat and fatty tissue. Exercise will benefit your bird, too, to help bring her weight down. Tests might also be done, especially if the tumor is large, to see if there has been any liver or other organ damage, if your bird's thyroid is working properly and if there is necrotic tissue within the tumor that is decaying and causing infection. Your vet will try to avoid surgery, but if the lipoma is big enough to cause pain and limit mobility, or if it is necrotic, hemorrhaging or infected, surgically removing the tumor is the best option for your bird's health.